Three months ago many of my compatriots voted to leave the European Union. What followed has not been pretty. Flare-ups of racially motivated abuse and violence; a Whitehall farce with in-fighting in parties, bully boy shenanigans and general disarray about what to do next; pressures on small businesses with costs rising as the pound tumbled; and lots of worry for friends whose life will be affected by Brexit. For me, like many who voted Remain, there has been sadness, frustration and anger. In the days after 24 June the instinct was to take to the barricades and support civil society organisations for the fight for labour, health, environmental, social… protections that are rooted in EU legislation. But with a political vacuum, it was unclear where to direct that energy. I was also tempted to scream more vehemently than is my nature, but the last thing society needed was more uncontrolled anger. And as my energy reserves are in deficit that was not going to help me either. So instead, I shored up my defences. I sought out silence, I watched for constructive opportunities and I found comfort in my own instinct to create rather than destroy. As the lace is more intricate than anything I have made before (and knitted on both sides), this shawl required concentration. With such focus my brain slowed down, figured out how the combinations of rows and stitches played together and marvelled at how this engineering drew shapes and embellishments. Having spent much of my childhood summer holidays visiting old cathedrals (they made for cheaper days out than visits to stately homes! ), I love soaring pillars, fan vaulting and expansive stained glass windows. 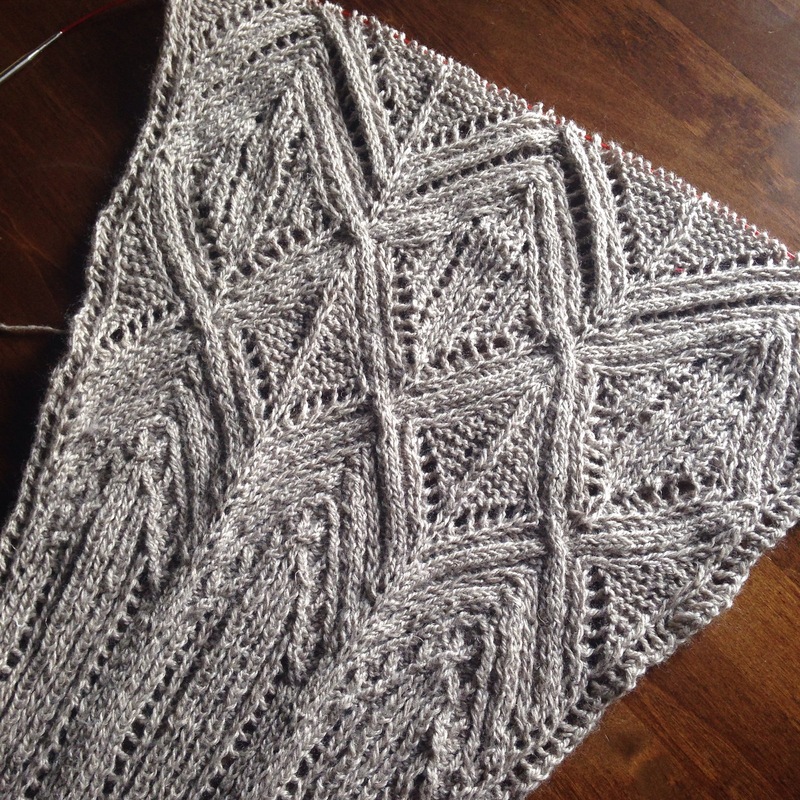 As my Uncia shawl knit up, its unusual shape, the mix of perpendiculars and fans, the cartouches of garter stitches… were comfortably familiar. The yarn I used, a British wool/linen mix from Blacker Yarns**, added to the sense of familiarity. The stone colour was similar to the limestone used in many Gothic cathedrals in France and southern Britain but the associations went deeper. The linen adds a coarseness to the material that softens with use. As the yarn ran through my fingers, I could feel the mix of roughly hewn and highly polished stone of cathedrals visited in my childhood. Linen also catches the light differently to wool adding a glistening lustre to the material, which reminded me of the thin film of damp on the walls of medieval churches. Whilst I normally detest damp in all its forms, I find the cool damp of ancient churches viscerally comforting. It triggers a connection with the generations of people who have sat in the same aisles down the centuries and reminds me that for all our differences, many of our hopes, fears and concerns are very similar. * This pattern is taken from The Book of Haps (edited by Kate Davies), which explores the history of this simple everyday shawl and its vibrant future. 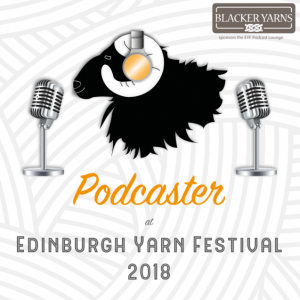 ** Blacker Yarns is an independent wool company that works with the Natural Fibre Company, a small mill in south west England, to champion British wool. It works closely with farmers to add value to the the remarkable fleeces available in the UK by producing quality knitting yarn. As a small business, it is financed from a variety of traditional sources but has also benefitted from some public funding, including some support from EU funds and programmes. 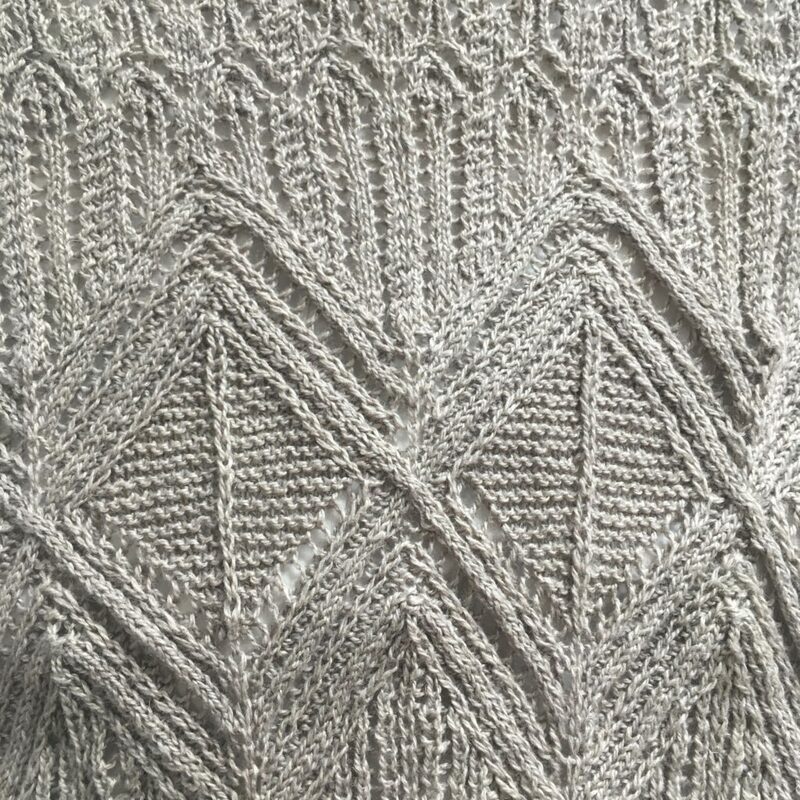 I love this, its so pretty – your knitting skills blow me away. I know what you mean about Brexit – its definitely not a disappointment thats going to go away… I spent the whole weekend crocheting and felt the same way – it is so meditative. I’m glad to see a favourable appraisal of this yarn, as I’ve been considering the linen/wool mix for a while, since reading (in John Styles’ Everyday Fashion in 18th Century England) how frequently it was used (as linsey-woolsey cloth) in proletarian clothing before the arrival of cheap cottons. It seems ripe for a revival, yet aside from the prosaic long-life socks stocked by Greenfibres, where linen has been added for longevity, and cotton is still present, the combination is frustrating hard to find. The book, incidentally, is fascinating for anyone interested in a longer-term perspective on consumption and aspiration. Thank you for your comment and sharing those book details. I think linen/wool mixes make perfect sense in our part of the world. Both fibres traditionally grow in our climate and have amazing natural properties (cooling and warming respectively and linen has some natural UV protection properties too). I can see why cotton became desirable and whilst it will always have a role to play my wardrobe, my increasing focus on a small local wardrobe means I’ll definitely be hunting out local linen and woollen/linen blends. 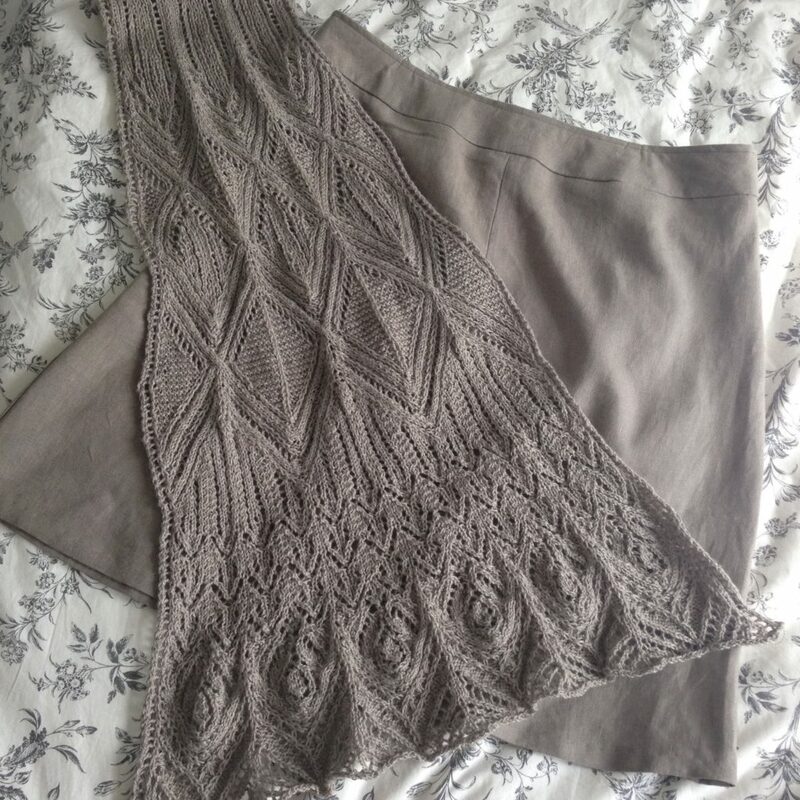 As regards Blacker Yarn’s wool/linen yarn, I think it would make a great alternative to synthetics & hybrids (like polyester or viscose, bamboo…) in drapey garments, like flowing summer tops or waterfall cardigans as the linen adds a lovely drape to the wool!